Sigh. Sad news that Robert Asprin has passed away. He was a bright talent and reading his books gave me a lot of pleasure. 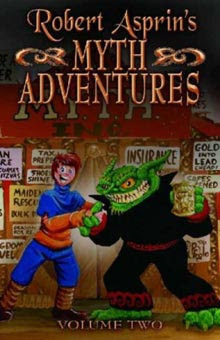 His later work suffered as a result of some problems he went through at one point, but the early Myth Adventures books, in particular, are gems. The best single-dollar purchase I ever made was in high school. One of my favorite stores, The Great Escape, had one of those Science Fiction Book Club combined editions on sale for a buck--a jacketless edition of the first four Myth Adventures books. I'd read a bit about the series (in an old Dragon magazine, I think) and decided to give it a shot and was absolutely hooked. I've re-read that volume at least a dozen times. I really, really like the first six books in that series, and have enjoyed some of the later ones, too. This Amazon Listmania list has a good take on the progression of the series. 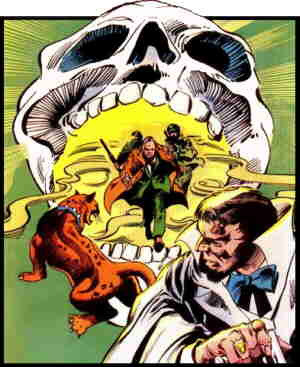 The first two Phule's Company books are great, too. And that's not even touching on the tremendous influence of the Thieves' World series. Sigh again. Peace be with you, Robert. 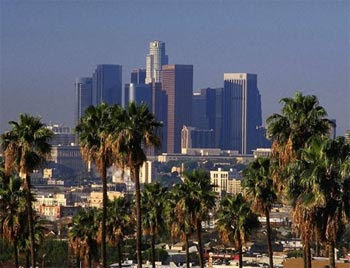 Come see me in Los Angeles this week! I don't know the exact date yet, but sometime in the next few days, my first interview for a podcast will go live at The Dead Robots' Society. 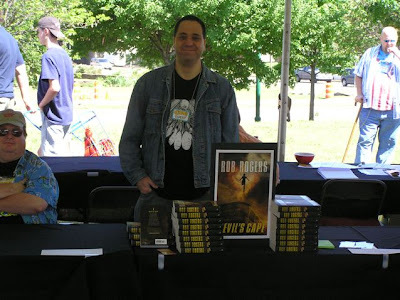 My old buddy Ry Stevenson, one of the site's hosts, does a one-on-one interview with me about Devil's Cape and the writing and publishing process. I had great fun with the interview--I hope you check it out. I'll post the details when I know them. UPDATE: The Dead Robots' Society has posted its own coming soon message. Blogger Michael Paciocco, who specializes a bit in cool faux motivational posters, has taken a look at Devil's Cape, and deemed it worthy of the cool image above. 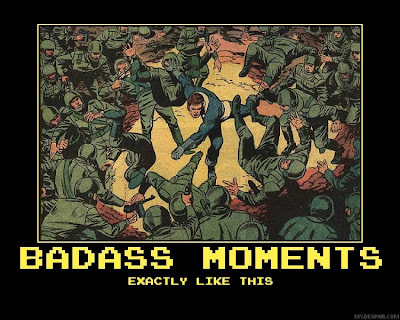 Man, some people I went to junior high with would be floored at the idea of me being associated with anything badass. Take that, kid who punched me in the stomach in the hallway for no reason in 8th grade. 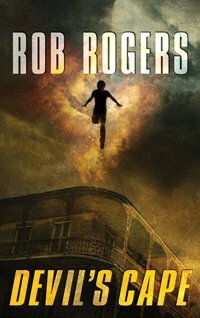 Rogers' strongest achievement is creating a setting that is reminescent of Gotham, New Orleans (a clear inspiration) and the Mos Eisley Spaceport from Star Wars, and has amplified the corruption and vice to their (super)natural extremes. Please take a look at the review and browse his blog a bit to check out some of his cool posters and such. 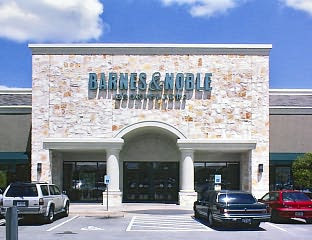 I've been remiss in my posting and am overdue for a report of the signing at a Barnes & Noble in Austin last Saturday. 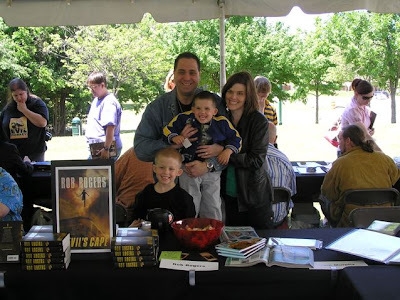 I was there with two other authors, J.M. McDermott and Martha Wells, and had a great deal of fun. I'll take a bulleted list approach to my thoughts and reactions to the signing after the jump. Got to have lunch with buddy Jeff Hebert. Very glad for the opportunity. Joe McDermott arrived a few minutes late (but with doughnuts--a good guy, that Joe) because someone purposely gave him bad directions. Weird. It's interesting signing with other authors. You kind of support each other and that offsets that weird, "I'm sitting here at a table greeting random people who are trying to avoid making eye contact with me" vibe. But you have to amend your approach a little bit. I didn't want to call out, "Hey, do you like superheroes?" like I might have otherwise, because if superheroes weren't that person's bag, I didn't want to drive a potential sale away from Joe or Martha. My old college friend Randi, who lives in Austin, came by with her sister and they bought three copies! I hadn't seen Randi in about 15 years, so it was really nice to catch up with her. Let's hope she likes the book! Joe and I chatted for a while in the parking lot on the way out, and while we were there, a man approached us to tell us he'd just picked up an autographed copy of Devil's Cape inside (this is one he'd purchased from the stack that I'd signed right before leaving for the day--not one I'd signed for him inside) and had already started reading it and enjoying it. I added a personal note for him; it was just cool that he walked over more or less just to tell me he was enjoying the book so far. I got Joe to autograph my copy of Last Dragon and bought a couple of Martha's novels, too. I'm looking forward to reading them. Devil's Cape reader Danny Montooth, who describes himself as a "Deviant Devil's Cape Citizen," was kind enough to send me these pictures he drew of Bedlam and Doctor Camelot. He drew these on a whiteboard at work, which is backstage at Disneyland! How cool is that? Thanks very much, Danny. These are very cool and I'm excited to get to post these for others to enjoy. There's sad news that legendary comic book artist Gene Colan is quite ill, suffering from liver failure. He's in need of expensive medical treatments. There are a couple of fund-raising efforts launched on his behalf. You can read more here and here. I've been a big fan of his for years, first discovering his artwork in the Night Force comic book, which I wish would be reprinted. I gave him a little shout-out in Devil's Cape by adding the name Colan to a junior high school. A tiny thing, I guess. Anyway, if you're in a position to help him, please consider doing it. If not, I encourage you to seek out his artwork. It's great. As someone who's worked in print and web design for several years, I found this video very funny and clever (and it reminded me of a client or two!). It's a little longer than it needs to be, but it's still good stuff. 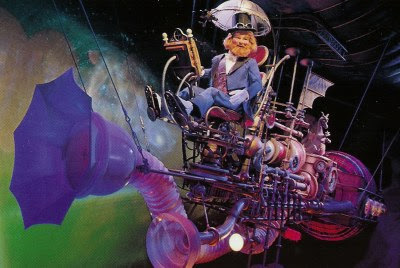 Mark Evanier reports that Walt Disney World might be considering re-revamping its Journey into the Imagination ride at Epcot, bringing back the lost-missed Dreamfinder character. This would be awesome. The ride lost almost all of its heart when it was gutted and modernized some years back. It's regained a bit since the more recent addition of "more Figment" to the mix, but to me, the perfect solution would be recreating the original and then never messing with it again. And yes, this would include using Chuck McCann as Mark suggests. For an interesting look at the original ride, check out this site. 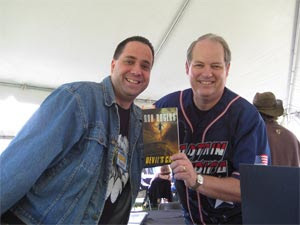 I'll be autographing copies of Devil's Cape in Austin next Saturday, so please stop by to see me if you're close by. This will be a group signing with J.M. McDermott and Martha Wells, so you'll get to meet three authors at once. What could be better? P.S. Yes, I know that the store doesn't list the event on its web site. I've learned that bookstores can be pretty flaky about such things, which is frustrating. We had overwhelming success on the poll at the Stained, Glass Windows blog. 18 votes for Devil's Cape to 5 for Shirley Jackson and 1 for Fluke. Gary's being a good sport about it. Thanks to all who voted on my behalf. Stained, Glass Windows is running a poll on which book blogger Gary should read next. Devil's Cape is losing to Shirley Jackson! I've lost the lottery before, but I've never lost to "The Lottery" (yeah, I know--different story; I'm just cracking wise here). Vote for Devil's Cape! Win one reader at a time! Yeah, OK, this is pretty tongue in cheek. But it's an interesting blog and I wish Gary's books were a little easier to get ahold of over here in the United States. Jigsaw Men sounds like a cool read. Check out the site. This year's CAPE event was yesterday and I had an absolute blast. I was nervous for the first half-hour or so as I had very few people come by my table, where I was selling copies of Devil's Cape and giving away bookmarks, and it was very windy and chilly, but people eventually began to come by and I started to sell copies and the day just rolled along. If you're visiting here today because you stopped by to see me at the event and got the URL from the bookmark, then thanks and welcome! I went back and forth on how much to charge for the book. It retails at $14.95 and the copies cost me about $10 each. For a little while I was deciding to charge $12 for them, but after my first sale, I decided to drop it to $10, as that seemed like a good price point and I wasn't really looking to make a profit there, just to increase sales for the book (and in fact I got the guy who'd paid $12 to come back over and gave him the $2 difference back). After I'd been there a while I changed my "$10" sign to one reading "CAPE Special: $10 (usually $14.95)" and that worked well for me. Richard at Zeus had helped me order a case of the book (24 copies) for the show (for special events, you either need to pay up front or get the event runner to order them and be invoiced for them). And I brought another case of my own copies to help make the display look substantial. I'd hoped to sell maybe a dozen or 15 copies of the book. By the end of the day, I sold 26, so I was quite happy about that. Dina and the boys stopped by for quite a while, as did my friend Michael and his daughter. The kids got to play together and I think everyone had fun. Attendees were cool and supportive. The picture above was sent to me by Robert Hurst, who bought a copy of the book and had the photo taken for his Facebook page. He was kind enough to send me a copy. Hope you enjoy the book, Robert! I got autographs from Gail Simone and Mark Waid, both of whom have written comic book stories I've loved, and gave both copies of Devil's Cape. I hope they like them! I particularly enjoyed getting to know the people at nearby tables and quickly became a fan of their work. I'm looking forward to buying Mark Murphy's Tiki Joe Mysteries (which comes out soon); had a great time chatting with Rob Osborne (of The Nearly Infamous Zango; I snagged the first two issues) and his wife Sarah; and I enjoyed meeting Thom Zahler, whose Love and Capes had me chuckling out loud. It's a small world sometimes--Thom's local friend Jesse Jackson, who sat next to me at the event, works at the same small company where I used to work before coming to my current company--the same place buddy Michael works now. You can see Jesse in the photo up top next to me in the Hawaiian shirt. Another gracious, nice person. Overall, it was a great, fun event. 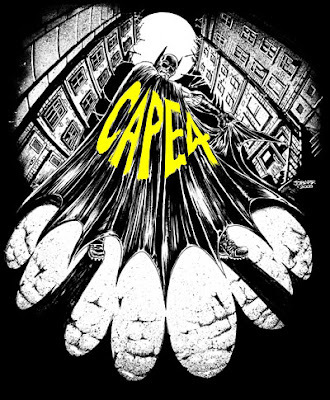 My thanks to all who stopped by to see me, especially those who bought the book, and my thanks to Richard Neal of Zeus Comics and the whole team behind CAPE. What an impressive, cool event.